Exploitation is nothing new, but no movie studio has ever brought as much joy to my heart as American International Pictures. My Mount Rushmore of film studios would have Hammer, Cannon, and American International Pictures on it, but American International would be on there twice. A few Junesploitations ago, I indulged my love of AIP by writing a piece about the history of the studio and what made them so special to me, but it’s our journey through the the year 1955 that really lets me pen a love letter to the brainchild of James H. Nicholson and Samuel Z. Arkoff. A refresher: this single film studio gave us the majority of the bikini/beach movies, the Edgar Allan Poe cycle with Vincent Price, dozens of hot rod and motorcycle flicks, and the best Blaxploitation classics of the seventies. When Nicholson and Arkoff founded their company in 1954, they called it American Releasing Corporation (ARC). Even though they started in ’54, none of the movies that started production that year saw the light of day until the magical year of 1955. Before ’55 was over, American Releasing Corporation had brought eight movies to theater screens. A full half of them were directed by a young filmmaker with no previous directorial credits on his resume. His name was Roger Corman. Like AIP, Corman also got his start in 1954 but didn’t blossom until 1955. After bumping around Hollywood for a while, he’d already been used and abused by a system that was happy to take his ideas but slow to give him credit. He decided to try his own hand at producing, and used some money he had made from selling a script to invest in a movie from Lippert Pictures called Monster from the Ocean Floor. Corman claims to have guided the film to completion in only six days, bringing it in at under half of the budget. With this one producer’s credit to his name, he began pitching a second film. This would be American Releasing Corporation’s first feature film, 1955’s The Fast and the Furious. That’s right, there’s a 1955 movie about criminals who run from the cops in sports cars through exotic locations and it’s named The Fast and the Furious. Corman was able to lure the film’s star, John Ireland, by allowing him to direct. However, he was so dissatisfied with Ireland’s final product that he decided he would direct the next movie himself, and a source that I just made up reportedly heard Corman tell Ireland “If you ain’t outta control, you ain’t in control.” Corman’s artistic complaints barely mattered; the movie made four times its budget and American Releasing Corporation was eager to continue their collaboration with Corman. 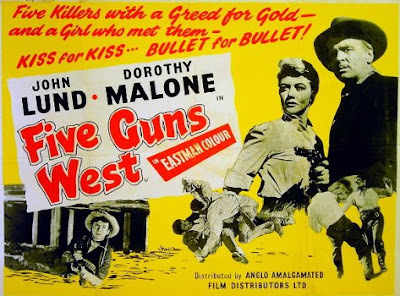 His directorial debut came in 1955 with the western film Five Guns West. Shot in only nine days, the Civil War action flick grossed almost ten times its budget. Though it didn’t set critics on fire, it established Corman as a director who could bring a movie in on time and on budget. Later in 1955, Corman also directed Apache Woman, another western that starred Lloyd Bridges, and a post-apocalyptic movie called Day the World Ended. 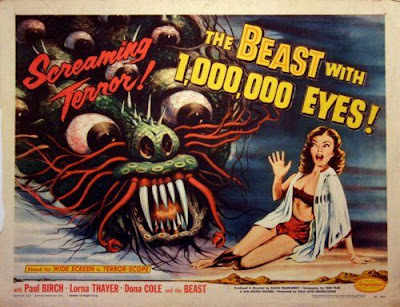 My favorite, though, is the 1955 sci-fi movie, The Beast with a Million Eyes. According to AIP historian Gary Allen Smith’s 2013 tome American International Pictures: The Golden Years, this was the final of Corman’s original three-picture-deal with ARC, and the budget that was left after the previous two films was smaller than what was initially expected. Rising to the challenge, Corman used public domain music, shot at a lightning pace (Smith says he shot 48 pages of the script in two days), and when the union came in and threatened to shut down the movie production because they were NON-union, Corman took over all directorial duties himself without credit, just to make sure the movie got made. This is the stuff of low budget legend, and it’s easy to see why Corman was such a valuable asset to a fledgling studio like ARC and how he has ended up as the “Pope of Pop Cinema.” By the end of 1955, American Releasing Corporation had established itself as a purveyor of youth culture and pop flicks, and Roger Corman was on his way to becoming a veteran of films that successfully balanced low budgets with high aspirations. Just a few months into 1956, American Releasing Corporation officially changed their name to American International Pictures, and the rest, as they say, is history. So that’s the history. Even though it’s really interesting, it doesn’t really address the question of if these AIP/Roger Corman movies are any good. Honestly, you can tell that these films were made on shoestring budgets and without the luxury of time and top talent, but they somehow transcend these limitations. The Beast with a Million Eyes takes time to embrace the more lurid aspects of the story--there’s a swimsuit scene for no good reason at all, and the neighbor is a mute peeping Tom who cuts women out of magazines and watches a girl from a hidden, treetop perch. The ship that the titular beast arrives in is literally a kettle that’s been slightly (and I mean very slightly) dressed up so it doesn’t quite look like something you see at tea time. The beast itself is on screen for less than five seconds. And yet the script has this upward-reaching sense of humanity, like it’s seeking to understand who we are and why we do the things we do. It touches on loneliness, isolation, and distrust, but it also tries to look beyond those things. Unexpected stuff in a cheap b-film that was never meant to do more than pad out a double feature. That’s really what makes these movies so special, and what fuels my never-ending love affair with b-movies. They make the most of what they have. Throw a cool concept together with a unique filming location, some gratuitous, crowd-pleasing elements, and a script that overcomes a low budget by having big ideas, and you’ve got the core essence of American International and the work of Roger Corman. Sadly, I haven’t seen all of these movies because some of them are incredibly hard to locate. 1955’s Apache Woman is one of eleven AIP movies that James H. Nicholson’s widow, Susan Hart, holds the rights to. Susan Hart (now Susan Hofheinz) was once one of American International’s most beautiful and charismatic stars, appearing in several of the studio’s beach movies before retiring from the public eye. As far as I know, none of the movies that she owns have ever seen a DVD release, much less a Blu-ray or digital release, and it’s a real shame. It would be easy to paint her as a villain, withholding her husband’s work from legitimate home release where it would be appreciated by collectors and film fans alike, but such a portrayal doesn’t quite fit the reality. She isn’t out of touch with reality, nor is she a self-serious baddie or religious convert who thinks these movies are indecent. I don’t really even know WHY she won’t let these movies be released. Many of us have been scratching our head for a very long time, wondering when, and now IF, we will ever get to add the eleven movies she owns to our shelf of AIP movies. I haven’t even found a good bootleg of Apache Woman (yet), so that I can watch an appreciate it. I started this look at AIP and Roger Corman by saying that exploitation was nothing new. This is technically true: as long as there has been cinema, there have been those who seek to appeal to the masses by giving them exactly what they want, usually in the cheapest, most lurid way possible. AIP and Corman came along and took exploitation and raised it to an art form by having high standards and work ethics. The fellas behind American International Pictures were masters at keeping their fingers on the pulse of what the public wanted, but they were also outstanding at selecting the right directors to make the movies happen. A movie pitch is still just a pitch without guys like Corman to bring them to life. And bring them to life they did, laying the tracks that are still being used by enterprising filmmakers today. This long train ride filled with wacky characters, scream queens, fast cars, and rubber monsters first left the station in 1955. Read more of Heath Holland's writing at his blog Cereal at Midnight! 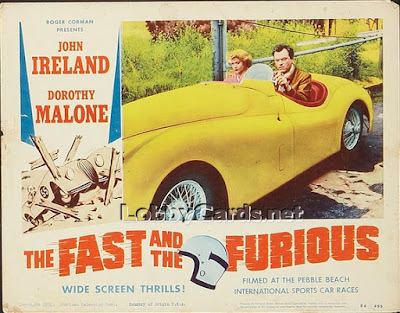 I saw The Fast and the Furious for Junesploitation one year, and liked it quite a bit (I was also surprised to see John Ireland and Dorothy Malone in such a low budget affair, so the added info about how Corman snagged Ireland is welcome). I think I found the movie on Netflix, and I'm not sure if it's still there. Whenever I see the AIP logo appear at the beginning of a film, a smile appears on my face. No single company has brought me more cinematic entertainment over the last decade than American International Pictures. That is quite a feat for a company that has not released much in the last 40 years. From the hot-rod and rock-n-roll films of the 1950s to the blaxploitaion films of the 1970s, there was an unrivaled consistency in entertainment and edginess in its exploitation productions. The career that Roger Corman forged with AIP would directly lead to the founding of New World Pictures, a company that would give the exploitation fan another treasure trove of films to enjoy.